#iSpyPacificEdge: A Fun Way to Earn Perks During Your Stay! Earn Pacific Edge perks just for sharing your adventures with us! 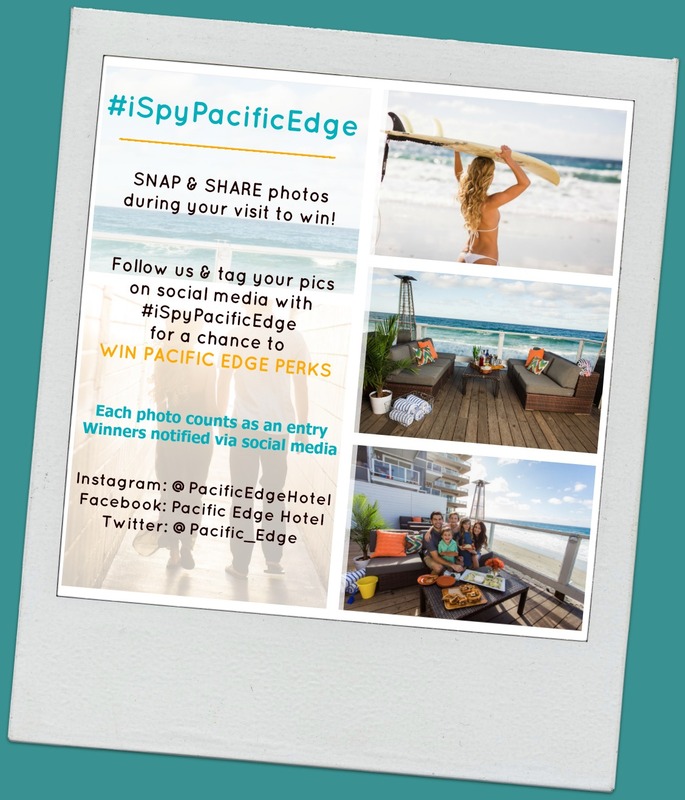 To enter to win, just follow Pacific Edge on social media and snap & share your vacation photos with #iSpyPacificEdge. Every week we'll be giving away perks like complimentary drink tickets, free valet parking for your stay, and even a grand prize each month where one winner will get to enjoy a beachfront Bungalow to share with friends and family on a return stay... on us! The fine print: Each photo counts as an entry (no limit). Winners will be selected at random and will be notified via social media. Bungalow grand prize includes a waived rental fee (typically min. $250) and are awarded upon availability. Food and beverages minimums and block out dates may apply on Bungalows. Must be at least 18 years old and not an employee of Pacific Edge Hotel or an immediately family member of an employee (husband/wife, child, sibling) to enter. This promotion is in no way sponsored, endorsed, administer by, or associated with Facebook, Twitter or Instagram. Participant releases Facebook, Twitter, and Instagram of any liability.